Bollywood actress Shilpa Shetty is known for her fitness and curvaceous and perfectly toned body, but she has a weakness just like all of us. She is a sweet tooth and just can’t stop herself from indulging into yummylicious deserts. However, she has found a way to deal with her cravings and has desserts only on Sundays and she calls it a ‘Sunday Binge’. Every Sunday, she shares a video having delicious desserts from all around the world. For this weekend, the lady is in London and have visited one of the popular cafes. 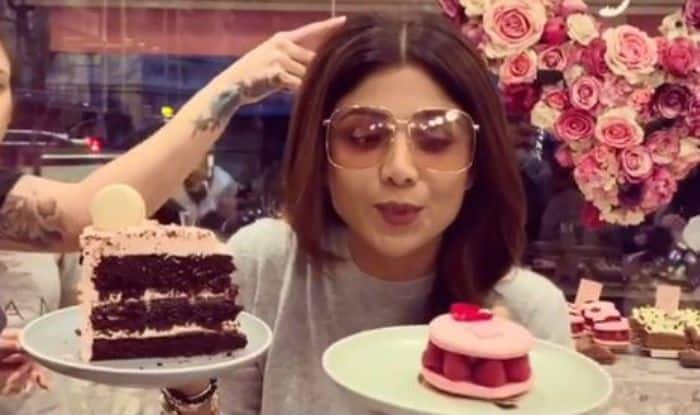 She took to Instagram to share the video, just like every weekend and this time she is seen indulging into the chocolate cherry cake, raspberry macaroon and triple chocolate mousse. In her post, she mentioned that after eating the monstrous desserts, she has gone into a food coma and can’t have the dessert for the next two weeks. Well, it will be interesting to see if she can hold onto her cravings. Well, the video will definitely make you rush to a cafe and have similar kind of delicious desserts. On the professional front, she is currently judging a dance reality show. On a related note, the actress has been in the industry for the past 25 years. She has worked in Telugu, Tamil and Kannada language movies aside from Hindi ones. She is a yoga practitioner and launched her fitness Yoga DVD in 2015. She has been staying away from films for quite some time. The actress has also judged many dance reality shows on the small screen.